If your future includes a move to Rio Vista, check out Meathead Movers! Our professionally trained student-athlete movers, moving concierge, and princess packers are prepared to get you safely moved into your new Rio Vista home. When you make your move to Rio Vista, be sure to contact Meathead Movers. No matter what type of moving service you need, our student-athlete movers are ready to handle all your moving needs. Welcome to Meathead Movers of Rio Vista! If you are moving to or from anywhere in Rio Vista, we are the moving company for you! Our professionally trained student-athlete movers and our move concierge are here to help you with every stage of your move in Rio Vista. Located in eastern Solano County, Rio Vista is a small northern California town known as the gateway to the delta. Halfway between San Francisco and Sacramento, this alluring river town offers a relaxing suburban way of life for its residents. With its proximity to Sacramento’s pristine rivers, marshes, and wetlands, Rio Vista is the perfect place for people who like to enjoy water activities. The city is also home to an annual Bass Festival Derby and a quaint little downtown district. 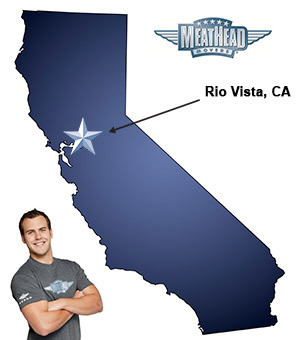 If Rio Vista’s peaceful way of life sounds appealing, Meathead Movers is here to help! Our moving company specializes in local, long distance, and commercial moves to, from, and within Rio Vista. We also provide reliable packing, storage, on-site relocations, and our distinctive concierge service, which connects you with local service providers. All our student-athlete movers are thoroughly screened and trained before their very first move. With branches not just in Rio Vista, but all throughout California, we are your one-stop resource for all your moving needs, no matter where your California move takes you. In fact, you can see what your neighbors in Rio Vista have to say about us! We are so confident in our services, that we even offer a 100% satisfaction guarantee! So, what do you have to lose? Contact Meathead Movers today for a free moving quote and learn how we can help you on your next move! Moving to Rio Vista? Here are some helpful resources. View more Rio Vista resources. Very nice people, easy to deal with. On time, accurate, careful with our furniture, reasonably priced. Extremely helpful guys doing the moving. We couldn't have been more pleased. The crew worked hard the whole time they were here and I was pleased with all they accomplished. They loaded our POD with furniture for pick-up. I opened the POD this afternoon to see if everything looked stable for the move and notice the dining room table against a metal file cabinet with no protection. Looking closer I noticed a 15" scratch along the table where the corner of the file cabinet had gouged it. We had numerous small rugs available for edges such as this, and wish one would have been used. I put one there now.